Situated on the shoreline of the land division of Laʻaloa is a large pocket of white sand, one of the largest onshore sand deposits along the 7-mile reach from Keauhou to Kailua. During periods of high surf, usually during the winter months, violent wave action will wash away the sand down to bare rock within twenty-four hours, causing the beach literally to disappear overnight. When the heavy surf subsides, normal wave action and ocean currents will slowly move the sand from the offshore reservoirs and redeposit it onshore. The accretion process often extends over a period of several months before the beach once again contains its usual volume of sand, and may be slowed or reversed by later assaults by high surf. The periodic flushing of this body of sand as it is moved offshore and onshore keeps it free of debris and very white. Over the years, the unique characteristics of this beach have been reflected in a number of different names, the most popular of which are Disappearing Sands Beach, Vanishing Sands Beach, Magic Sands Beach, and White Sands Beach. The County of Hawaiʻi prefers the last of these names, so the site is called White Sands Beach Park. This very small park borders Aliʻi Drive. Facilities - include restrooms, showers, a lifeguard tower, and a parking lot. A coconut grove in the backshore provides some shade for sunbathers and picnickers. A shallow sand bar that fronts the entire beach slopes gently to the deeper waters offshore, providing a safe swimming area. Throughout the year, a small shorebreak on the sand bar produces waves suitable for novice bodysurfers and bodyboarders. 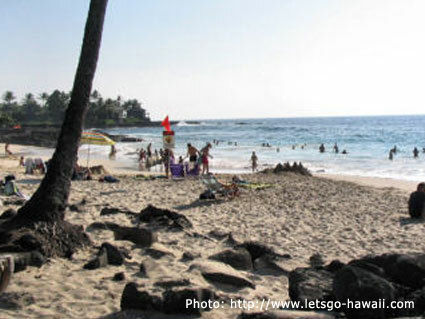 The attractive white sand of the beach, the park facilities, and the gentle shorebreak combine to make this one of the most popular parks in Kona, a favorite with visitors and residents alike. During the summer months and on weekends and holidays throughout the year, the park is usually crowded from end to end with sunbathers and bodysurfers. When high surf rolls into Kona, however, the shorebreak at White Sands Beach Park is very strong and generates a powerful rip current that usually runs north into the open ocean. This becomes a serious hazard and occasionally results in near-drownings. The county lifeguards and Fire Department rescue personnel who are called to help report that they treat more injuries at this beach than at any other in Kona. When the shorebreak closes out, experienced bodysurfers move to the break directly outside the point fronting the comfort station where some of the best bodysurfing waves in the Hawaiian Islands can be found. The point break can hold rideable surf up to 10 feet and spectators line the shore to watch the big-wave bodysurfers in action. During the winter months the annual Magic Sands Bodysurfing Championship, the only bodysurfing contest held on the Big Island, attracts large crowds. Just south of White Sands Beach Park is a small rocky cove. Snorkeling and nearshore scuba diving offshore the cove are excellent.